WINNIPEG - The Winnipeg Jets squandered a magnificent opportunity to bury the hatchet on the Nashville Predators once and for all Monday night. Entering game six of the Western Conference Semifinals atop Nashville three-games-to-two, Winnipeg was unable to put together any sort of attack in game six, falling 4-0 to a Predators squad hungry for another game. Watch the highlights of last nights game. To some, the words “game seven” are the two greatest words in the NHL. But to the city of Winnipeg, they were the last two words any Jets supporter wanted to hear Monday night. Following a game five loss in his home barn, Nashville’s P.K. Subban guaranteed that his teammates would fly out to Winnipeg, win game six, and come back home to play in game seven in front of the Predators fans at Bridgestone Arena. He made good on that promise Monday night. There was some uncertainly heading into Monday’s game six regarding forward Bryan Little’s status in relation to the Jets’ lineup, as the 30-year-old did not take part in morning skate with the rest of his teammates, and was not available to the media. Following practice, Head Coach Paul Maurice made it clear that Little would certainly be an option for game six. All doubt was cleared up quickly as Bryan Little took the pre-game warmup and in-turn centred a line consisting of wingers Joel Armia and Nikolaj Ehlers Monday. Heading into game six, it was the first time in the 2018 Stanley Cup Playoffs that Pekka Rinne entered a game with a save percentage sub .900. Coming into Monday’s game with a .898 save percentage and a 3.22 goals against average, the Nashville netminder was hoping to put up a bounce-back performance, from his six-goal game five showing at Bridgestone Arena on Saturday evening. He did exactly that. It was not an enjoyable opening period of hockey for the Winnipeg Jets Monday night. The only goal of the frame came just 1:02 in as Viktor Arvidsson redirected a Roman Josi point shot past Connor Hellebuyck while falling. It was originally called a high-stick on the ice, but after a brief conversation with Toronto, referee Wes McCauley overturned the call – much to the displeasure of the hometown fans. Although welcomed by a packed house of white-clad Jets’ fanatics and neighbouring streets jam-packed with #WPGWhiteout supporters, the home team just could not get anything going in the game’s opening 20 minutes. Even in being handed three power plays on Nashville hooks, trips and delay-of-game calls, Winnipeg was unable to beat Predators’ goaltender Pekka Rinne. Making things worse, the Jets hardly found themselves fully ‘set-up’ on any of those three power play opportunities. While trailing handily in quality chances, Winnipeg managed to draw even to Nashville’s 10 shots in the frame. The Jets did manage to beat the Predators in the faceoff circle – leading 12-9 in puckdrops through 20 minutes of play. The second period featured a much better start from the Jets, as many early scoring opportunities arose, but Winnipeg was once again unable to capitalize. Trade deadline acquisition Paul Stastny had the best opportunity of the period for the Jets just six minutes in, as the veteran forward collected a bouncing puck that deflected off of a linesman, before carrying it to the Nashville net, and jamming at the rebound. Rinne stood his ground on that scoring chance, and every other possible Winnipeg opportunity in the segment. Eight minutes into the middle frame, Nashville struck. Following a bad Tyler Myers pinch, Filip Forsberg boxed out Ben Chiarot before picking up the puck and walking into the Jets’ zone. Although battling a hook and a tumble, Forsberg potted the game’s second goal, putting his Preds up 2-0 midway through the contest. The Forsberg goal came against the flow of the play of the period, as the Jets had maintained control for the better part of the frame, however, Forsberg’s apparent dagger appeared to spark some life in Winnipeg’s game. Blake Wheeler, Nik Ehlers and Dustin Byfuglien all had quality chances offered up in the direction of Rinne, but solid goaltending by the Nashville tendy kept the puck out of the Predators’ net for the remainder of the period. Winnipeg retained a hold of the shot lead, 19-17 after 40 minutes. It took Nashville just six minutes to seal the deal in the third period. After being roughed up in front of the Jets’ net, familiar foe Filip Forsberg collected a centering pass and put the puck between his legs before beating Hellebuyck on a nifty little play for his second goal of the game, completely silencing the crowd gathered inside and out Bell MTS Place. Forsberg’s linemate Viktor Arvidsson collected his second of the game with the Winnipeg net empty for the extra attacker. Immediately following the goal, Patrik Laine shot the puck to the corner of the rink, mere feet from Arvidsson and his gathered teammates. The two teams momentarily exchanged punches, but the damage had already been done. After putting together the best home record in the league through the 2017-18 regular season, the Winnipeg Jets have found themselves stymied for goals and victories at home in their last 120 minutes of play in Manitoba. The last time that Winnipeg was shut out at home came at MTS Centre, not Bell MTS Place. Near the end of the 2016-17 season the Calgary Flames rolled into Winnipeg and beat the Jets 3-0 on March 11th. The team has since seen 53 games at the recently re-named home arena. On top of all the bad, there is some good, as Winnipeg has already won two of three road games at Bridgestone Arena this series. One might suggest that the warm weather played a factor in the Jets’ inability to control the puck all game. With temperatures reaching 31.4 degrees Celsius on Monday, the Jets played the warmest home game since returning to Winnipeg as a franchise. The Jets battled the puck and fought bounces all game long. Hellebuyck could not be held accountable for the outcome Monday, as the Jets’ poor play was a deep-rooted issue, extending from the top to the bottom of the lineup. The Winnipeg goaltender stopped 25 of 28 shots in a losing effort, while the Jets were unable to beat Rinne on any of their 34 shots directed his way. Forsberg led the way for Nashville with two goals, one assist and a plus four rating in the game. In fact, the Johansen-Arvidsson-Forsberg line had a combined four goals, eight points and a plus 12 rating on the night. 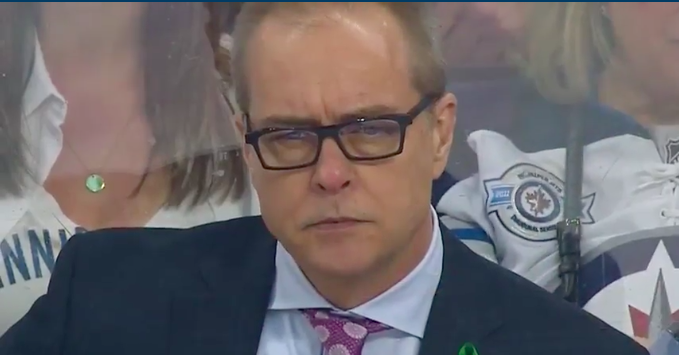 The most disappointing stat of all for Winnipeg, may have been the fact that the Jets went 0-4 on power play opportunities Monday, including three chances in the first period. Had any of those man advantages produced just a single goal, who knows how this one would have turned out. Game seven will go Thursday evening in Nashville. The victor of this pending winner-takes-all clash will move on to the Western Conference Finals for a dance with the surprisingly competent Vegas Golden Knights. Puck drop is scheduled for 7:00 P.M. central time, and the game can be viewed live on CBC and Sportsnet. It will also be broadcasted on TSN 1290.